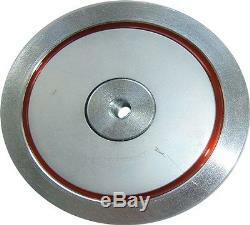 This is a one sided permanent Treasure Salvage Strong Neodymium Magnet 200kg pull power. Its marked and desined as 200kg pull power and real time force is about 240kg. Lost any KEYS or a Weapon down a drain or overboard on a boat! All you will need is a STRONG rope. It's also named as. See video Bellow What you can find with this strong magnets. In a lot is provided only ONE super powerful, super strong, one-sided retrieval neodymium permanent magnet. Such magnet is capable to withstand more than 200 kilograms of vertically suspended metal load. This magnet is made in Russia, for treasure and relics hunter who looking for a treasure and relics and is developed specially for search in the agressive water environment This is the qulity made searching magnets from one of Russian defensive factory. Treasure Salvage strong magnet was made of NdFeB with Tings, appearance does not rust, usually placed in room temperature, the maximum operating temperature is 80 ° C , and it never will demagnetization. Material: NdFeB (Nd-Fe-B), Epoxy compound, ST32 stainless steel. Magnets Dimensions: 75 mm 16mm (Diameter Thickness). Pull Power : more than 200Kg (its marked and desined for 200kg pull power but real time force is 240kg). Picture shown is for illustration purpose only. Actual product color, size and weight may vary due to product enchancement. To get your full real 200kg power each side (also as any other treasure searching magnet) it's need to be attracted to "ideal surface" here is the rules thats need to be comply. Plain and pure Fe object 2. Thickness of this object not lower than 4mm and not higher than 6mm 3. Attached to the object with full surface of magnet 6. Pull up only 90 degreee vertically ANY little deviation from this list will cause critical reduction this magnets pull power. You may watch video bellow. There's a factory test of 400kg magnet. 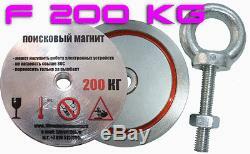 Your 200kg magnet is real tested about 240kg if you you will stick to this rules. This retrieval Magnet has only one working surface that does it by the inexpensive tool in case of search conditions from the boat or from the bridge. 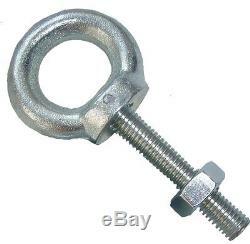 This magnet is capable to withstand 200kg vertically suspended load. The strength of this magnet is significantly lower if it is enclosed sideways, on a fracture or on hauling! Don't drill it or heat over 80C! Magnets never were in the use, but can have small scratches connected to the production technology and transportations. All from this video might be easily recovered with magnet 300-400kg pull force. YOUR SATISFACTION IS OUR TOP PRIORITY. The item "TREASURE SALVAGE MAGNET 200Kg Pull Power, STRONG RETRIEVING neodymium MAGNET" is in sale since Wednesday, June 3, 2015. This item is in the category "Consumer Electronics\Gadgets & Other Electronics\Metal Detector Accessories". The seller is "*messer*" and is located in Rostov-na-Donu, Rostovskaja Oblast. This item can be shipped worldwide.